Also known as Degenerative Joint Disease or Spondylosis/Spondylitis when it affects the spinal joints. 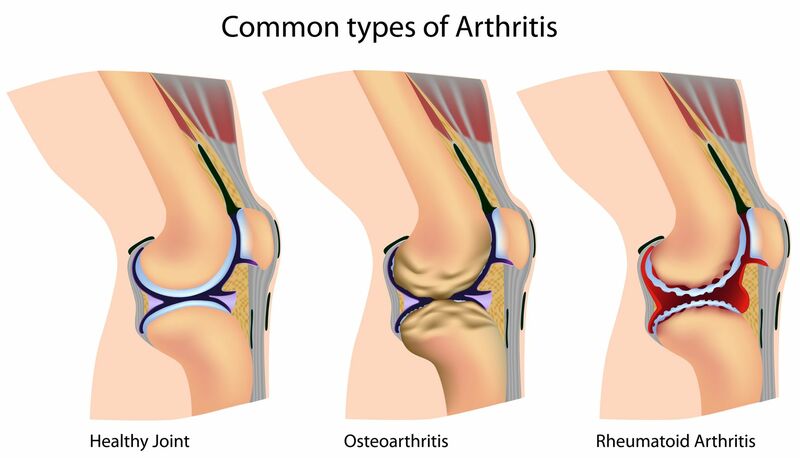 Osteo-arthritis is basically "wear and tear" and affects us all to a certain degree as we get older. An X-ray will show whether the level of wear is consistent with the patient's age. It commonly affects the neck and lower back, and although the arthritic process itself cannot be cured, the symptoms can often be helped or even disappear with chiropractic treatment. When it affects the spine, it is usually the soft tissues around the joint which causes pain, rather than the arthritis itself. This will explain why some people have pain for a short period of time, even though they show signs of marked osteoarthritis on the X-ray. Osteo-arthritis is very often symptom free providing the spine functions reasonably well. Osteo-arthritis can also affect the large joints such as hips and knees, which may need replacing, and it's often found in the small joints of the hands and fingers. An inflammatory type of arthritis which usually doesn't affect the spine. It is mainly found in the joints of the fingers and toes and in the shoulders, elbows, hips and knees. The joints are often red, hot and swollen and can be very tender to touch. Chiropractic only has a limited role to play in the treatment of this condition, which is often managed with anti-inflammatory medication.